It’s rare anymore that a buck isn’t described in terms of inches of antler. Although scoring systems have been around for decades, it is only recently that the majority of deer hunters describe their buck in this manner. From typical to non-typical, net to gross, there are all types of ways to judge the “quality” of our harvests. I too am guilty of this, rarely seeing a buck without muttering what I estimate his score to be. Maybe that’s my nature as a biologist, but most average hunters seem to do the same. 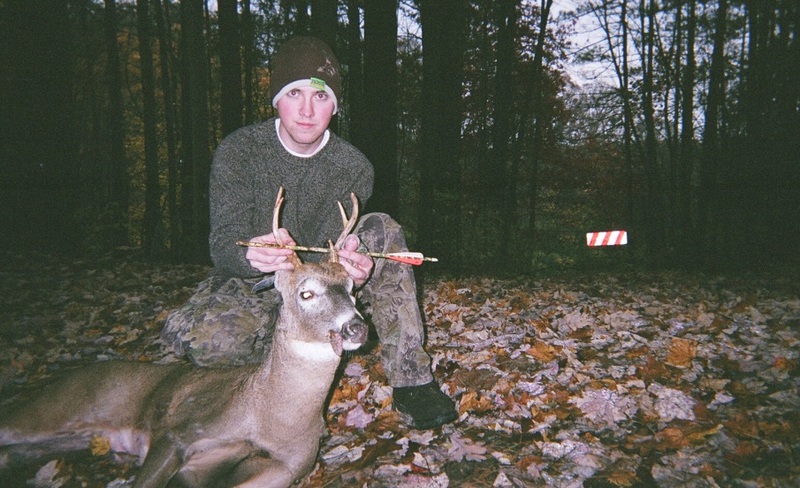 I was recently thumbing through some old pictures of me growing up and hunting in Pennsylvania. I couldn’t help but think about all the memories and excitement over the small bucks we shot. Those memories played a key role in molding me into what I am today as a biologist and hunter. I often wish I could go back to those days where simply saying “I shot an 8-point” ignited complements and interest around the hunt. Is it bad that nowadays many of us think too much about how others will judge us over what we shoot, rather than what will make us happy? You’re calling that a point? I bet he doesn’t have a 15-inch spread! At some point in our lives, we have heard them all. Some legitimate facts, others subjective opinions. But in today’s society, where hunters are often looked at as outcasts, we often put a lot of attention on the pure size of a trophy, rather than the experience around it. Over the long haul, that is likely not going to bid well for us as a group. Not all that long ago, hunting was a means to an end. Hunt to put food on the table, as my grandfather often did for my grandmother, mom and her siblings. This was a way of life, and often a necessity to continue to live. Sure if someone shot “the big one” it became talk of the town, but rarely was it paraded and celebrated like deer are now. In fact, many of those old-time racks are now being brought back into the spotlight. Back then, hunting was just much simpler. Maybe not in terms of harvesting a deer, but instead without all the flash and glam like there is today.However, herds were often mismanaged and deer numbers spiraled and peaked in very unhealthy rhythms. One thing today’s hunting industry has done is contribute a lot of dollars to better manage deer herds. When I started hunting in the ‘90s, we were past the point of saying you got “a buck” and graduated to the number of points. So if you walked up to someone and they said they killed an “8-point,” it didn’t matter if it was a 5- or 15-inch spread, he was a good one! My first buck was a spike. That first deer gave me a feeling that I will never forget when I squeezed the trigger. The treestand I hunted from produced an opening-day buck several years in a row. None of them were bigger than an 8-point and likely 2 ½ years old and younger. But, I could describe each of those hunts with unbelievable detail to this day. Fast forward to this past year when I harvested two mature bucks, one was a 150-class. I’ll start by saying that buck is hovering over my desk as I write this, and I replay laying my hands on him every time I look up. But, I passed a lot of smaller bucks that day; my focus was on killing a big shooter. Here’s my point: Don’t let the outside world guide YOUR hunting experiences. I admit, in a couple of weeks I will be chasing a giant (170-class) whitetail that has shown up on my lease in Kansas. At the same time, I’ll be feeling a little “empty.” It’s a feeling that hits me every year due to missing my Pennsylvania deer camp after Thanksgiving. It’s a place where just being there makes the hunt successful, and I would be thrilled to take a 2 ½-year-old, 90-inch buck. Be a role model for all those young and new hunters coming through the ranks. Encourage them that it is more about the experience, than it is about inches of antler. I know that someday down the road when my 2-year-old can hunt, I will be encouraging him to shoot the first legal deer that makes him happy, no matter what it is. In the end, the memories will last a lot longer than anything we take home in the back of the truck. Editor’s Note: Watch what hunting is truly all about each week on “The Bone Collector.” Check the schedule page for current air times.